Best Chinese Knives: Tonife Squirell: Great Small Full Tang EDC Fixed Blade Neck Knife! Tonife Squirell: Great Small Full Tang EDC Fixed Blade Neck Knife! This is a cool little fixed blade I received a few weeks ago and would like to tell you my thoughts and impressions of it. I've been looking at this model for some time now, but just recently pulled the trigger on it. My main concern was about the practicality of such a small fixed blade (this is a dedicated neck knife and I don't wear those) over a folding knife and the pretty short blade it has (a bit less than 2 inches). The knife arrived in a Tonife branded box with a black neck chain and some paperwork in English and Chinese. It was sharp (not hair splitting, but sharp), no fit and finish issues, sat great in the sheath (almost no rattle and actually got even better with time). - The design. Especially the part about this being an original design from a Chinese knife company, that is smart, appealing and that I really liked. I even like the name they gave it (fits it very well). - The execution. It is made really well, from the 3D milled G10 scales, the tan real kydex sheath, the metal tubes and the fact that those all are fitted great around the full tang blade. - The looks and the concept. I like that the Chinese have noticed the love neck/small knives in general get in recent time and made one that can compete with budget offerings from other knife companies. I also like that the design is very people friendly and not intimidating at all (sort of like Spyderco knives - it raises smiles more than fear). - The ergos. Those are surprisingly good, especially if you attach a snake knot lanyard to it. - I loved that as it turns out this could comfortably be carried in the small pocket of my jeans and because the sheath is slim but wide - it gets stuck in the pocket, so the blade deploys easily and quickly. That increases the knife's overall functionality for me (as I don't wear neck knives). Tried it as a neck knife - works great as well. - The price - although it is made well and has original design - the price is still dirt cheap. - The steel. It's 440A (7Cr17MoV), nothing really special about it. It does take an edge well and could be easily restored if gets dull. - The blade length could be a bit longer IMO (would also increase the practicality). - As you might have noticed - I really like this knife! 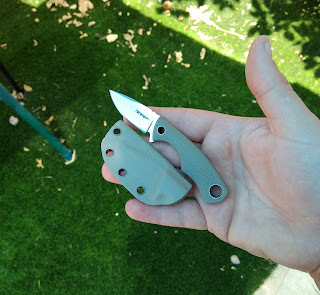 It is so fun to carry and it could be practical as an urban primary/backup people friendly blade for those light EDC tasks - opening packages and envelopes, cutting paper, ropes, ducktape, zip-ties and even light prying tasks. Also could be a funny and original small gift for even a non-knife person. I like the Victorinox Swiss Army Trekker pocket knife. It's a little better than the cadet, tinker and farmer, the locking blade is a nice feature. but come on its hard to take serious any top 10 under $50 list that does not include the Buck 110.